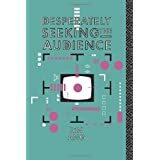 Desperately Seeking the Audience ReviewThe author has done a good job into proposing ways we don't have to remain a passive TV viewer giving ideas of the way we can make out TV programming better. The audience is what TV companies need, so we must decide what we want to see and how we want to see it. Want to learn more information about Desperately Seeking the Audience?